Courses listed in italics count for both the medical degree and the undergraduate degree. All students spend ½ day each week in Continuing Care Clinic beginning in September of Year 3. The only exception to this is during Vacation months, Preceptorship, and out-of-town electives. Year 1 and 2 students must register as full-time students as established by the University Registration and Records Department. Each student must be enrolled in a minimum of 12 credit hours during a Fall or Spring Bachelor’s degree semester and a minimum of 6 credit hours during a Summer (June, July) Bachelor’s degree semester. Full-time enrollment in Years 1 and 2 can be fulfilled by a combination of required medicine courses and Bachelor’s degree courses. Year 1 students are limited to 21 hours of enrollment in Fall and Spring Semester. Enrollment in 22 or more hours must be petitioned to the Council on Curriculum. Year 2 students are limited to 10 hours of enrollment in Summer Semester and 22 hours in Fall Semester. Enrollment for 11 or more hours in Summer, or 23 or more hours in the Fall, must be petitioned to the Council on Curriculum. Year 2 students in Spring Semester can enroll in only their scheduled required coursework (HSF I-IV, Clinical Correlations and Fundamentals of Medical Practice IV). Enrollment in additional courses will not be allowed. BA/MD Students will continue Bachelor’s degree coursework during the Summer Semester of Year 3 (Human Structure Function IV and Clinical Correlations). Enrollment in additional coursework during this semester will not be allowed. All Year 4 BA/MD students will also enroll in a minimum of 12 hours of undergraduate course work during their Fall or Spring bachelor’s degree semester. Students who petition and are approved by the Council on Curriculum to take a Summer Semester in Year 4 must take a minimum of six Bachelor’s degree hours. BA/MD medical students who were not enrolled in the Alternate Program for Year 1 or 2 are not allowed to petition to waive the required Year 4 campus. Medicine and Audited courses do not count toward the minimum credit hour requirement for the Bachelor’s degree semester. Students that are enrolled in coursework for credit in the School of Medicine’s MD degree programs are not permitted to simultaneously enroll in another degree program that is not under the auspices of the Council on Curriculum. The Associate Dean of Curriculum will review petitions under exceptional circumstances and in cooperation with the Council on Evaluation. A student will not receive credit for a Bachelor’s degree course while enrolled in a Medical School credit block. (See Medical School Blocks Credit Policy). The Associate Dean of Curriculum may grant an exception to students retaking medical school required course(s) due to failure, withdrawal, or GPA issues. 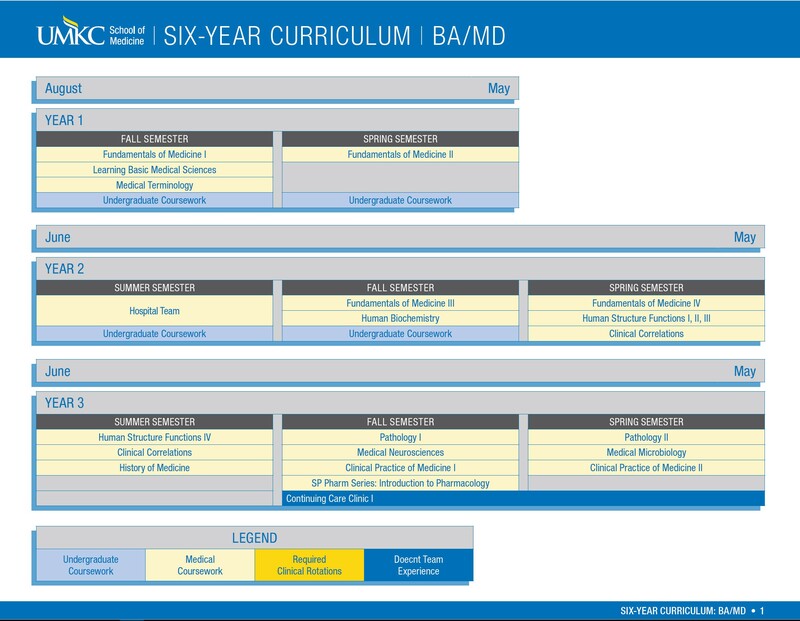 This chart is composed of all required courses and rotations that are scheduled in Years 3 through 6. This chart lists guidelines that are designed to provide the student with a framework for scheduling medicine blocks. The minimum prerequisites for each rotation are given to ensure that students are adequately prepared for each experience. The guidelines offer recommendations for the year level in which a student may schedule a required medicine block. If prerequisites are met, the student may take that medicine block before he/she is formally promoted to the year in which the course is recommended. These guidelines also indicate the flexibility that is available for scheduling medicine blocks. The Council on Curriculum, in consultation with the Education Team Coordinators (ETC’s), may limit the use of flexibility to maintain an overall balance in scheduling to prevent excessive postponement of courses and/or an imbalance of students for required rotations. It is imperative that the balance of rotations is maintained whenever possible to provide each student with a optimal educational experience. The purpose of this chart is to identify the areas of flexibility in the curriculum plan and try to fit the curriculum with the academic needs of each student. When preparing student schedules, ETC’s, and Docents should keep in mind such things as, when the student plans to take the United States Medical Licensing Examination (USMLE) and the student’s need for elective time in Year 6, etc. 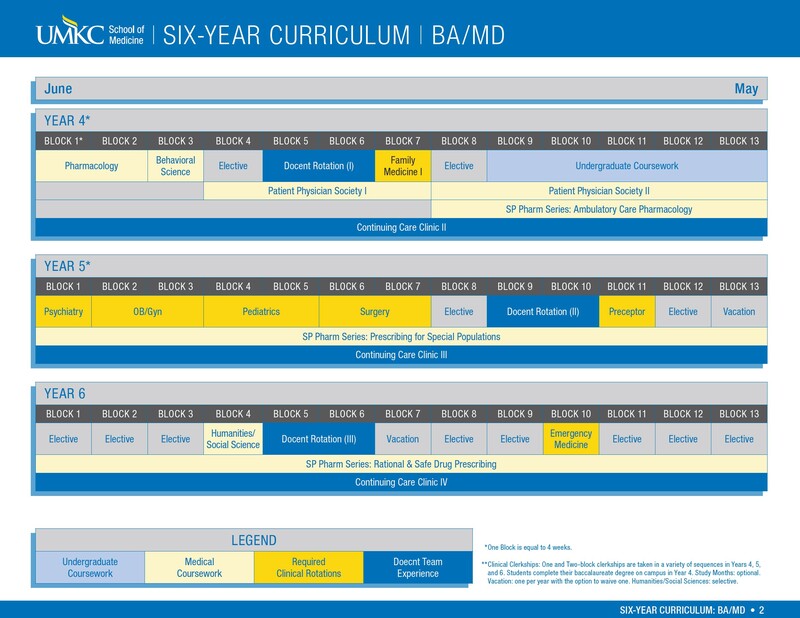 This chart is composed of all required courses and rotations that are scheduled in Years 3 through 6. This chart lists guidelines that are designed to provide the student with a framework for scheduling medicine months. The minimum prerequisites for each rotation are given to ensure that students are adequately prepared for each experience. The guidelines offer recommendations for the year level in which a student may schedule a required medicine month. If prerequisites are met, the student may take that medicine month before he/she is formally promoted to the year in which the course is recommended. These guidelines also indicate the flexibility that is available for scheduling medicine months. The Council on Curriculum, in consultation with the Education Team Coordinators (ETC’s), may limit the use of flexibility to maintain an overall balance in scheduling to prevent excessive postponement of courses and/or an imbalance of students for required rotations. It is imperative that the balance of rotations is maintained whenever possible to provide each student with a optimal educational experience. Students are required to successfully complete 38 Blocks (BA/MD) or 34 Blocks (MD only) of medical school credit for graduation. A student cannot enroll for credit in more than one medical school rotation or elective per block. A student cannot receive credit for a medical school block (rotation or elective) while enrolled in Bachelor’s degree coursework for a semester. Semesters are defined as August through December (Fall Semester), January through May (Spring Semester), and June and July (Summer Semester). School of Medicine Malpractice Insurance will not cover students while on vacation or Leave of Absence. Any BA/MD student failing or withdrawing from Human Structure Function (HSF) I will automatically enter the Alternate Year 2 program. The Alternate Year 2 student must enroll in HSF II and III on an audit basis while completing concurrent Spring semester coursework (Fundamentals of Medical Practice). During the Summer and Fall of Alternate Year 2, the student enrolls in a minimum of one science course in each semester. If student received a grade of “C” in a previous science course offered they must repeat that course, if available, in that semester. During the Spring of Alternate Year 2, the student re-enrolls in HSF I, HSF II, and HSF III for credit. All students, in their alternate Year 2, must achieve a science GPA of 2.8 or better. Any BA/MD student failing or withdrawing from HSF II will automatically enter the Alternate Year 2 program. The Alternate Year 2 student must enroll in HSF III on an audit basis while completing concurrent winter semester coursework (Fundamentals of Medical Practice). During the Summer and Fall of Alternate Year 2, the student enrolls in a minimum of one science course in each semester. If the student received a grade of “C” in a previous science course offered they must repeat that course, if available, in that semester. Any BA/MD student failing or withdrawing from HSF III will automatically enter the Alternate Year 2 program. These students will enroll in BMS 9311 (Medical Microbiology) and BMS 9310 (Medical Neurosciences). If successful in both courses, students will progress on to MED 9312 (Pathology I). These students will enroll in HSF IV in the Summer semester, following MED 9313 (Pathology II). These students will enter the Fall Bachelor’s Degree semester and enroll for course(s) needed to complete their B.A. degree. These students will re-enroll, for credit, in HSF I, HSF II, HSF III, and HSF IV in the following Spring and Summer semesters. Upon successful completion of HSF I, HSF II, HSF III, and HSF IV the student will enroll in BMS 9311 (Medical Microbiology) and BMS 9310 (Medical Neurosciences), and if successful, will enroll in MED 9312 and 9313 (Pathology I and II). All students, at the end of Year 3, must achieve a science GPA of 2.8 or better in order to promote to Year 4. MD students do not enter the alternate Year 2 program as outlined above. Students must enroll in HSF II and III on an audit basis while concurrently enrolled for credit in Fundamentals of Medical Practice IV. These students will go on Leave of Absence for June-December. This takes the place of the MD LOA that is normally scheduled during Years 4-6. Spring semester: re-enroll in HSF I, HSF II, and HSF III for credit. Upon successful completion of HSF III, the student will continue on to enroll in HSF IV in the summer. Students must enroll in HSF III on an audit basis while concurrently enrolled for credit in Fundamentals of Medical Practice IV. Students will take a Leave of Absence for June-December. This takes the place of the MD LOA that is normally scheduled during years 4-6. These students will enroll in BMS 9311 (Medical Microbiology) and BMS 9310 (Medical Neurosciences). If successful in both courses, students will progress on to MED 9312 and 9313 (Pathology I and II). These students will enroll in HSF IV in the Summer semester. These students will go on Leave of absence for August-December. This takes the place of the MD LOA that is normally scheduled during years IV-VI. These students will re-enroll, for credit, in HSF I, HSF II, and HSF III in the Spring semester and HSF IV in the Summer semester. BMS 9310 (Medical Neurosciences) requires the prerequisite of successful completion of Human Structure Function III, and enrollment in Human Structure Function IV. Students may enroll in BMS 9310 if they receive a ‘W,’ ‘D,’ ‘F’ or ‘Incomplete’ in HSF IV. They must have successfully completed HSF I, HSF II, and HSF III with a grade of ‘B-‘ or better. BMS 9311 (Medical Microbiology) requires the prerequisite of successful completion of Human Structure Function III, and enrollment in Human Structure Function IV. Students may enroll in BMS 9311 if they receive a ‘W,’ ‘D,’ ‘F’ or ‘Incomplete’ in HSF IV. They must have successfully completed HSF I, II, and III with a grade of ‘B-‘ or better. Med 9312 and 9313 (Pathology I & II) requires the prerequisites of two out of three courses in year III (HSF IV, Medical Microbiology, Medical Neurosciences). Students receiving a ‘W,’ ‘D,’ or ‘F’ in ONLY ONE of the core courses may proceed to Pathology. Students receiving a ‘W,’ ’D,’ or ‘F’ in only ONE of the three courses may proceed to Pharmacology in Year 4. Every student is required to complete a two-block Docent Rotation in Year 4, Year 5, and Year 6. The Docent Rotation is the least flexible part of the student’s curriculum. If a student postpones or fails a Docent Rotation in any academic year, the consequence may be to extend the student’s graduation date. Students are expected to take their Docent Rotation with their assigned team for each of the three years. Each of the yearly self-paced pharmacology courses is a required element of the curriculum. Each Fall Semester, Year 3 students will register for 9385 and all Year 6 students will enroll in 9685. Each Spring semester, all Year 4 students will enroll in 9485 and all Year 5 students will enroll in 9585. The courses must be completed in sequence (e.g. 9385 is a prerequisite for 9485, and so on). Students who are on leaves of absence or who will be extending, can petition to complete the course work in a semester other than the assigned semester but the request should be made in writing, by the student and addressed specifically to the Course Director. Once a petition is filed, a plan will be formulated to the satisfaction of both the student and course director that outlines the students’ responsibilities. It is only upon completion of this process that enrollment in these courses will be entertained outside of the regularly assigned semester. Students should consider tuition or graduation implications of enrollment in this coursework when drawing up their petitions. Individuals who do not complete the instruction by the end of their assigned semester will receive a failing grade. Due to Graduation requirements, Year 6 students will not be allowed to schedule their vacation or an out-of-town rotation during the month of their graduation (typically May). The Readmission Committee consists of the Chair of the Council on Selection (who serves as the Chair of the Readmission Committee), two voting members from the Council on Selection, two members from the Council on Evaluation (including its Chair), and one student who is a student member of the Council on Evaluation. At least two members of this Committee shall be physicians. Recommendations of the Readmission Committee are forwarded to the Council on Selection for a final decision on whether an applicant for readmission shall be offered readmission. The Assistant Dean for Admissions and Recruitment will screen readmission applications for compliance with readmission requirements. Students who meet the minimum requirements for readmission will be invited to interview. When reviewing applications for readmission, the Readmission Committee and the Council on Selection will have access to School of Medicine documentation as it pertains to an individual applicant for readmission. The following guidelines have been developed to direct requests for information by the Readmission Committee of the Council on Selection as part of their holistic review of candidates for readmission. It is the intention of these guidelines to provide the Readmission Committee and the Council on Selection with appropriate access to relevant information to inform admission decisions and to protect the privacy of students who may become candidates for readmission to the UMKC School of Medicine. Council on Evaluation documents: The Chairperson of the Council on Selection may request from the Chairperson of the Council on Evaluation the opportunity to review any minutes, student action sheet, or other relevant documentation in any instance in which a candidate for readmission to the medical program is identified within such Council on Evaluation documents. OASIS Evaluations: The Chairperson of the Council on Selection may request from the Office of Medical Education the opportunity to review the OASIS evaluations for an applicant for readmission. Honor Council Documents: The Chairperson of the Council on Selection may request from the Honor Council the opportunity to review Honor Council minutes in any instance in which a candidate for readmission to the medical program is identified within the Honor Council minutes. The action taken by the Coordinating Committee on the Honor Council recommendations will also be provided to the Readmission committee. Requests for review of Honor Council material at this level should be granted but only with the full awareness of the chairperson of the Honor Council. Following review of Honor Council minutes, the Readmission Committee may direct the Chairperson of the Readmission Committee to request from the chairperson of the Honor Council additional view-only access of a file of a candidate for readmission. Review of this confidential student file may be undertaken only by the Chairperson of the Readmission Committee and one additional designated voting member of the Readmission Committee. No copies of any materials within the student file may be made and the contents of the Honor Council file may not be removed from the secure viewing room. Student Affairs Advising Notes: The Chairperson of the Council on Selection may request from the Associate Dean of Student Affairs the advising notes for an applicant for readmission. After the review of a complete application for readmission, School of Medicine documentation pertaining to the candidate for readmission, and the results of the interview process, the Readmission Committee will formulate recommendations for readmission and forward those recommendations to the Council on Selection. The Council on Selection will make the final decision about readmission. All interviews, Readmission Committee meetings, the Council on Selection meeting, and the notification of the readmission decision to students will take place between June 1 and August 1. If successful, applicants should be ready to commence work in the program in September of the year of application for readmission or January of the following year, depending upon the applicants’ curricular needs. The minutes from the Readmission Committee meeting and the Council on Selection meeting will be submitted to the Coordinating Committee to ensure that the readmission policy was followed appropriately. The readmission of students will be considered separately from the admission of M.D. Program students. Three current references, at least two of which should be from individuals who know that applicant academically. The application and all application materials must be received in the School of Medicine Office of Admissions by May 31. Students are eligible to apply for readmission one time. Students typically will be readmitted at the Year 2 second semester level and will be expected to be continuously enrolled for 53 months. Students who left the program in Year 4 or above will be readmitted at a year level specified by the Readmission Committee. The curriculum of readmitted students will usually be the same as the curriculum of MD students. If students wish to be granted an exception to this rule, they must petition the Council on Curriculum. A full transcript of course work taken while in the School of Medicine and since leaving the School will be made available to the Council on Curriculum at the time of readmission. That Council will annually review and approve curriculum plans for readmitted students in consultation with the student’s docent and Education Team Coordinator. The first year of readmission will be considered a probationary period. Thus, readmitted students will be subject to all conditions and stipulations set by the Council on Evaluation for students on probation. Council on Evaluation guidelines and policies will apply to readmitted students. In order to be considered for readmission, an applicant must first contact the School of Medicine Office of Admissions at medicine@umkc.edu for the full readmission policy, requirements, and application materials. A limited number of students, referred to as MD students, enter this program with a minimum of a bachelor’s degree and in some instances a graduate or professional degree. These students enter the medical program and enroll in the Human Structure Function series. For students who wish to graduate in May of Year 6, the program allows for up to five blocks of leave of absence. MD students must complete the Council on Evaluation leave of absence paperwork. The Associate Dean for Curriculum reviews all MD student leave of absence paperwork; taking into consideration individual curriculum plans and graduation requirements. Enrollment in the School of Medicine for 48 months. Four vacation months (one per 12 month period) during the 48 months of enrollment. Successful completion of 34 months of UMKC School of Medicine credit for graduation. Participation in Fundamentals of Medicine IV (MED 9220) concurrent with participation in Human Structure Function I, II, III. Enrollment in all required School of Medicine rotations and courses with students in Years 3 through 6 of the six-year program including the Self-Paced Pharmacology Series (Fall of Year 3 through Fall of Year 6). MD students are not permitted to take leave of absence during the Patient Physician Society Series (typically Fall and Spring Year 4). All students will be required to complete a one-month Medical Humanities course in Year 5 or 6. Completion of three electives from nine categories, with one elective fulfilling the critical care requirement. The requirements for admission to the School of Medicine are governed by the School of Medicine Council on Selection, the admissions committee for the School of Medicine. The Council on Selection is composed of faculty, administration and students who screen applications, determine which candidates will be offered an interview and make all final admission decisions. Admission decisions are based on an individualized and holistic review of applications, and there is no one component of the application process that guarantees an offer of admission. The School of Medicine Office of Admissions maintains administrative responsibility on behalf of the Council on Selection. OMS+MD students are selected jointly by the School of Medicine Council on Selection, the School of Dentistry Advanced Education Committee and the Department of Oral & Maxillofacial Surgery, however the Council on Selection administers the admissions process for the medical school portion of the curriculum for this program. Candidates for the OMS+MD program must adhere to the policies and procedures of the Council on Selection. The process for selecting candidates for the OMS+MD program takes place one time each year in the fall semester, and no more than two students are accepted each year. OMS+MD students begin their first year of residency in June. After one year of residency, they begin the 24-month medical school curriculum. OMS+MD students “transfer” into the fifth year of the School of Medicine’s six-year program and complete 24 months of exclusive medical education. At the end of the medical school portion of their studies, they return to the Department of Oral and Maxillofacial Surgery to complete their residency. A requirement of the OMS+MD transfer policy is that students must sit for Step 1 of the United States Medical Licensure (USMLE) examination before matriculating into the School of Medicine. OMS+MD students must sit for Step 1 during the first year of residency. OMS+MD students must also pass a standardized patient clinical skills examination. Withdrawal or dismissal from the oral surgery residency program will mean dismissal from the medical school program. Beginning in Fall semester, students will participate in weekly clinic (Year 4 Continuing Care Clinic). Students will also participate in weekly clinic (Year 5 Continuing Care Clinic). **Sequence of core clerkships is contingent upon space availability. First Internal Medicine Clerkship must occur in August-September of students’ first year in the program (“Year 5”). Three clinical electives are required for graduation selected from a minimum of three of nine possible categories: Family Medicine, Internal Medicine, Pediatrics, Surgery, Radiology, Pathology, Neuro/Psychiatry, OB/GYN, Miscellaneous. One clinical elective must be in a critical care area, e.g., surgery, medicine, pediatrics, etc. Students wishing to transfer to complete the clinical components of their education are considered for admission with advanced standing to the UMKC School of Medicine. Students will only be considered for transfer into the fifth year of our six year program, and must complete two years of medical education at the UMKC School of Medicine. In a given year, a limited number of positions may be available. For more information about the Transfer Student Admission with Advanced Standing process, please go to http://med.umkc.edu/md/transfer_program/ or contact the School of Medicine Office of Admissions at medicine@umkc.edu or 816-235-1870. The Alternate Curriculum is designed to allow select students more time in the Year 1 and 2 curricula to acquire the essential knowledge, skills, and attitudes to successfully complete required courses. Students may voluntarily enroll in the Alternate Curriculum or be placed in the Alternate Curriculum because of academic probation. Meet all requirements of the Council on Evaluation as stated in the Council on Evaluation Policy Manual and Guidelines. Enroll in a minimum of one science course each semester (Fall and Winter). This will be in addition to or in accordance with the requirements of the Associate Dean for Curriculum and the Assistant Dean for Years 1 & 2. Extended Year 2’s in the Alternate Curriculum must participate in Ambulatory Care II at the School of Medicine, except those times when the college of Arts & Sciences is on vacation during the Fall and Winter semesters. Extended Year 2’s in the Alternate Curriculum will take Learning Basic Medical Sciences (LBMS) during the Fall and Winter semesters of the Alternate Curriculum. The Associate Dean for Curriculum will approve curriculum plans for Extended 1’s and 2’s in the Alternate Curriculum. Extended students in the Alternate Curriculum will be extended in the program for at least one full year. The Years 1 & 2 Alternate Program is designed to allow students more time in the Year 1 and 2 curriculum to acquire the essential knowledge, skills, and behaviors to successfully complete required courses. Students may self-elect to enter the Years 1 & 2 Alternate Program due to specific personal reasons, such as a medical leave or other life circumstances, or they may be required to enter the Years 1 & 2 Alternate Program as a result of their placement into the academic probation. Students will enter the Years 1 & 2 Alternate Program according to Council on Evaluation policy. Enroll in a minimum of two science courses each semester (Fall and Spring). This will be in addition to or in accordance with the requirements set by the Associate and Assistant Dean for Curriculum and the Assistant Dean for Years 1 and 2. Enroll in a clinically focused School of Medicine course, such as Fundamentals of Medicine or Ambulatory Care, in each fall and spring semester. Enroll only in those courses listed on the Alternate curriculum plan as approved by the Assistant Dean for Curriculum and Assistant Dean for Years 1 and 2. Extend the first two years of curriculum into three years. Thus, the minimum timeline for BA/MD program completion extends from six years to seven years. Upon entering the Years 1 & 2 Alternate Program, students will be asked to sign an agreement acknowledging their acceptance of the alternate program requirements that are required to continue in the School of Medicine combined BA/MD degree program. Students will take coursework that fulfills requirements for their bachelor’s degree and strengthens their knowledge and study habits in the basic sciences. Each student’s curriculum will include repeating all failed program-required courses. Students may not alter their Alternate curriculum plan without receiving approval from the Council on Curriculum through the petitioning process. A student’s academic performance while in the Years 1 & 2 Alternate Program will be monitored each semester. Students maintain eligibility for each semester in accordance with Council on Evaluation Policy. All students are subject to the required cumulative science grade point average for promotion and retention where applicable. The list of required courses used to calculate the cumulative science GPA appears in the table below. No substitutions to the list may be used in the calculation of cumulative science GPA. Only one grade will be counted for each required course. If a required science course is repeated, only the final grade is used in the science GPA calculation (the initial grade earned in a repeated course will be dropped from the cumulative science calculation only).